In order to play pool at a high level you need to develop great skills at setting up to the ball as accurately as possible as well as great skills at controlling the cue ball with a perfect stroke. The equation of “perfect set up” plus “perfect stroke” should more often than not equate to a result of a “perfect shot”. 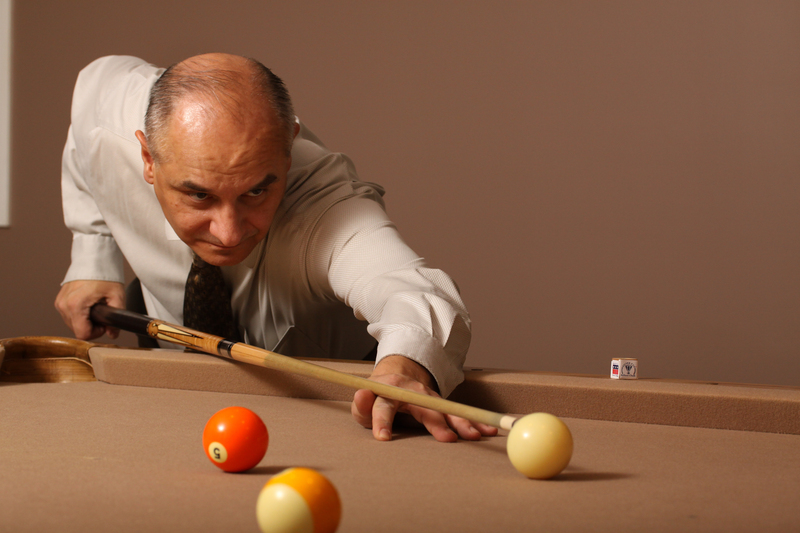 This article will focus on how to set up to the cue ball as perfectly as possible. Most players are very sloppy in how they get down to the cue ball. If you approach the shot with no intention of being as perfect as possible then you will probably reach your goal of not being as perfect as possible. Not everyone has to have the same system of setting up to the ball to be a good system. However, in order to set up perfectly every time, you will need a good system that you can depend on. Not setting up perfectly doesn’t mean that you will miss the shot but it definitely contributes to many missed shots. Develop a habit of setting up to each shot the same way every time with the same desire for perfection. Try lining up your cue ball to where you want it to be on the object ball when it contacts the object ball. This is called the “Ghost Ball Method” of aiming. Draw a line from the center of the cue ball to the center of the Ghost Ball and set your cue and your body up as accurately as possible on that line. I believe that the best way to ensure that you will line up straight is to get back behind the cue ball at least 6 feet, then slide into the line. When getting down to the shot try getting the toes of your right foot and the cue stick on that line. Then place the cue stick as close to the cue ball as possible to determine the distance your body should be from the cue ball. Then get down to the shot by setting the rest of your body up in the most perfectly balanced stance to your already planted right foot. To double check if you are set up correctly look to see if the toes of your right foot are directly under your right hand and that your right hand is directly under your right elbow. Good balance is also important so make sure that you have some weight on your bridge hand (10-15%). The rest of your weight should be distributed almost equally between both feet, but focused on the balls of both feet, especially your left foot. I am including 2 pictures to illustrate the point. The first picture shows me in my stance from the side. Pay attention to the relationship between my right elbow, right hand, and toes of my right foot. Actually in this picture my right hand is slightly behind the perfect position. It is not hanging down perfectly straight under my right elbow. My hand should be up forward approx. 1 inch to be directly under my right elbow and directly above the toes of my right foot. However my balance is very solid. Notice that my left foot is approx. shoulder width and approx. 1 foot forward of my right foot. My left knee is bent slightly forward of my shin and leaning slightly inwards towards my body. This forces my weight to be forward and on the balls of my feet. My right leg is only slightly bent and the heel of my right foot is angled slightly inwards while my left foot forms a line that is parallel to my cue stick. 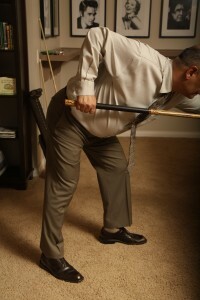 The slightly angled right foot and the slightly forward and inside bent left knee assist in moving my hip out of the way of the cue stick, allowing free unhindered movement of the stroke. In the second picture notice how close the cue tip is addressing the cue ball. Also notice that my left arm is bent. This helps me stay loose, allows my head and shoulders to get closer to the cue ball, and creates a closer relationship between both hands. My cue stick is as low and as parallel to the floor as possible. Note: These directions are for a right hander for simplicity. A left hander should follow these directions with the opposite body parts. Remember the most important details are the relationship between your right elbow, right hand, and toes of your right foot. The other important details are: the cue tip as close to the cue ball as possible at address and lining up accurately to the ghost ball. The actual stance is a matter of preference but I definitely recommend focusing on good balance for effortless power and effortless control. I hope you enjoy experimenting with my recommended set up. Most impressive Paulo..textbook, easy to understand and follow step by step! Highly recommended.